Grilled Jerk Chicken is an easy, delicious and quick recipe with 5 minutes prep time and 14 minutes to cook. It’s also a healthy, low calorie, low fat, low carbohydrates, low sodium and WeightWatchers (4) PointsPlus+ recipe also. 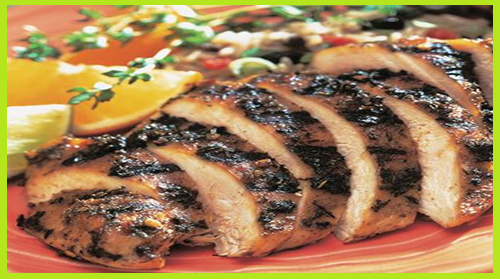 Bring the flavors of Jamaica to your family and guests with Grilled Jerk Chicken. 1. Mix seasoning, orange juice and onion powder together in a small bowl to make a paste. 2. Rub paste on both sides of chicken. 3. Preheat grill to medium. Grill 6 to 7 minutes per side or until chicken is cooked through. Serving Size: (about 6 oz) per serving.